The IPS Series features 4 identical windings and 2 secondaries, each rated at 0/104/110/120 volts allowing for rating combinations of 104V, 110V, 120V, 208V, 214V, 220V and 240V with primary and secondary isolated from each other. 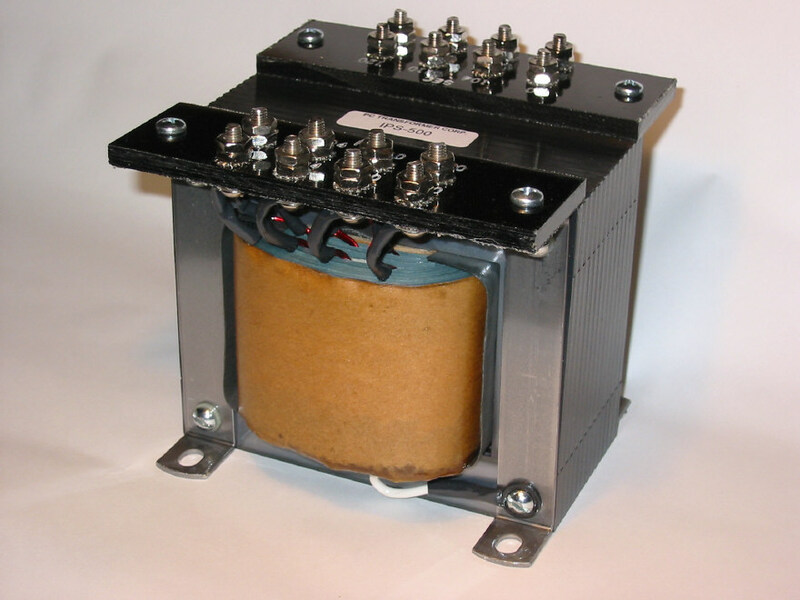 Step-down of 440V to 220V or step-up of 220V to 440V can be achieved by inter-connecting primaries and secondaries in an Auto-Transformer configuration. This eliminates isolation but a doubling of the power rating can be realized. The DIPS series is similar to the IPS series except the dual secondaries are each rated 0/208/220/240 volts. 50Hz to 500 Hz operating frequency range. Electrostatically shielded with shield grounded to the core. This connection can be opened for floating shield. 1/4 inch thick phenolic terminal boards with nickle plated brass hardware (#10-32 on 250V and 500 VA; 1/4-20 on 1000VA and 2000VA). Voltage rating can be varied with easy to make interconnections. Completely varnish impregnated and ruggedly constructed with prime raw materials. Well insulated and designed to withstand 2500 VRMS hipot. 55 degree C temperature rise above ambient. Volt-Amps Secondary Ratings Mechanical Dimensions Mtg. & Term.